Space Exploration Matters, But Being The First To Go Somewhere In Space … Doesn’t. I’m a self-admitted ‘space geek’. So to me, space exploration matters. But being the first to go somewhere in space … doesn’t. Let me offer some historical context. The first steam engines appear to have been built by Thomas Savery in 1698 and Thomas Newcomen in 1712. Do you remember them? I didn’t think so. The only name that we associate with early steam engines is James Watt, who built his engine in 1769. The first recorded steamboat was invented and built by John Fitch in 1787. Do you remember him? I didn’t think so. We remember Robert Fulton, and credit his Clermont in 1801 as the first steamboat. So it is with exploration. Throughout history, it‘s not being first that matters. There is archeological evidence of colonization in Greenland by Leif Erickson’s Norse Vikings as early as the 11 century. Many sailors from Europe may have arrived here, not knowing what they had found. There are early 15 century maps predating Columbus suggesting that some early Portuguese explorers had been here and done some coastal mapping. Even Imperial China may have visited the Americas; possibly more than once. And yet it is Columbus and Spain that get credit for discovering North America for Europe. I believe that the reason is simple. Historical time was right, and Spain was ready and willing to explore and expand its influence. With that exploration came wealth, and over 300 years of power, empire and riches. Spain was followed by key players like France and Britain. Britain, while relatively late to the colonial game, ended up building perhaps the greatest empire in history, which lasted for about 400 years. Note, though, that the Brits weren’t first. So who was actually first to come to North America from Europe? Essentially, it was nobody we remember. History remembers those that make something of what they find. So, in 1969, the United States got to the Moon. All the United States has on the moon 40 years later is some abandoned hardware, some foot prints and tire tracks, and a few laser reflectors. Don’t get me wrong. It was a great achievement. But under the program that President Obama has put forward – the “New Direction” and “Flexible Path” — that may be all we’ll ever have. Going back to the moon inspires comments amounting to, “Been there. Done that.” And the Obama plan doesn’t offer a firm destination. … That’s why it’s called “The Flexible path”. Under this plan, NASA will develop new technologies, but with no actual destination. Many in the space community are advocating going past the moon to new, more distant and more exotic objectives; near-earth asteroids and Lagrange points, and even the moons of Mars. And that’s great. I’m all for it. But not if we’re going to simply skip past the moon. Colonizing the moon actually makes good sense to me. It’s only about three days away by spaceship, so it’s a great way to test new ships and heavy lift rockets before going REALLY far away. The Moon is a great place to learn how humans respond to long periods of low gravity. Going to Mars, astronauts will spend many months in zero gravity, and then be faced with Martian gravity at 1/3 of ours. Will they be able to adapt to that much gravity after at least 6 months with basically none? Will they be able to function at all? And what about the year they’ll spend coming back? How will we deal with the tremendous amount of hard radiation that’s in space all the time? Can we shield ships adequately for months or years at a time? And when we get to Mars, will their habitats protect astronauts from cosmic radiation pouring out of space to the Martian surface? On the moon, we can test and develop those technologies, and learn the things we need to know for long-duration missions, but do it close to home. At some point, future astronauts will have to ‘live off the land”. There are minerals and elements on the moon that would allow an established colony to build what it needs, and more. They can build structural materials, electronics, chemical plants, and even fuel depots. A colony on the moon will give us the time and opportunity to learn how. The moon can be a test bed and way station for moving out into the solar system in a serious way. And all this is feasible with current or foreseeable technology. And here’s the thing … Getting back to what I was saying about being first not mattering? If we don’t go, someone else will. It’ll be the Chinese or the Indians or the Europeans … It’ll be SOMEone, whether or not it’s us. But hey … We were first! 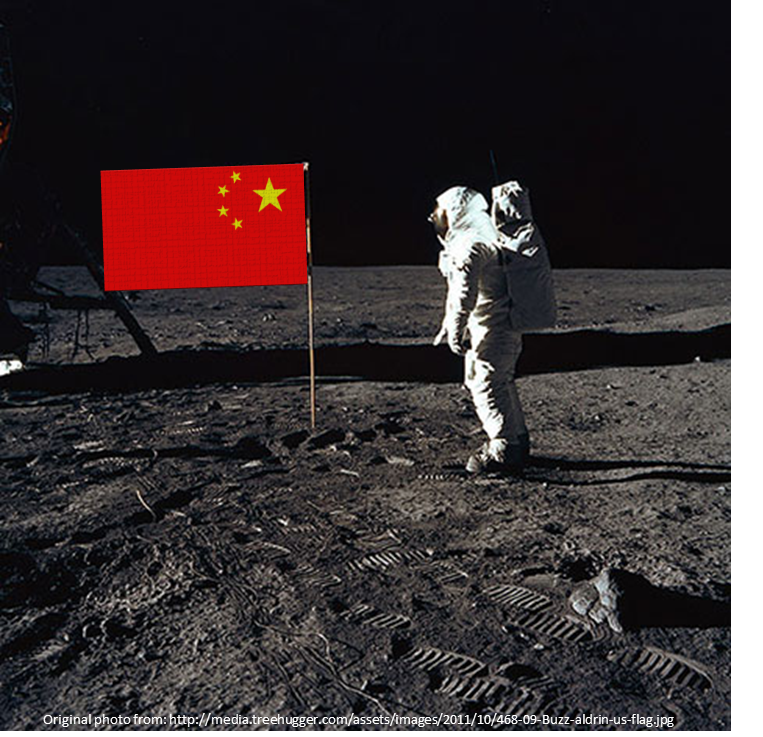 The United States should make up its mind to go to the moon again, but this time to stay. We should go to asteroids and Lagrange points, but we should learn how to do it from the moon. We should go to Mars, but we should learn how to do it on the moon. The moon is in “Near Earth Space”, metaphorically just up the street. It’s in our neighborhood. We’re old enough now to go up the street and make ourselves at home in our larger neighborhood. And it’s past time to do it. This entry was posted in HISTORY, OPINION - POLITICAL, SOCIAL, POLITICS/DOMESTIC, POLITICS/INTERNATIONAL, SCIENCE & TECHNOLOGY and tagged apollo, asteroid, astronauts, China, clermont, columbus, Erickson, Fulton, greenland, Lagrange, lunar, mars, moon, nasa, Near Earth space, Obama, Peoples Republic of China, portugal, prc, spain, vikings, Watt by Thinkwing Radio. Bookmark the permalink.